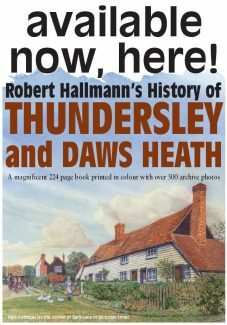 Renowned local author Robert Hallmann has written an essential history of Thundersley and Daws Heath. The ancient parish truly deserves this delightful book of over 200 pages, amply illustrated with over 300 pictures and using numerous sources, many rare and not previously published. 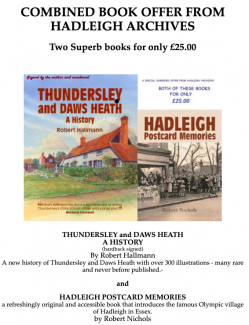 Building on the continued success of, and maintaining the production qualities of, Hadleigh Postcard Memories, Hadleigh and Thundersley Community Archive is delighted to publish the book for which so many of you have asked. From farming to motor cycle manufacture, Thundersley people have shown industry and ingenuity in conserving ancient woodlands and commons despite continued development pressures. Including artists, writers, buildings, families, maps and speeding vehicles; it is a hugely interesting read! 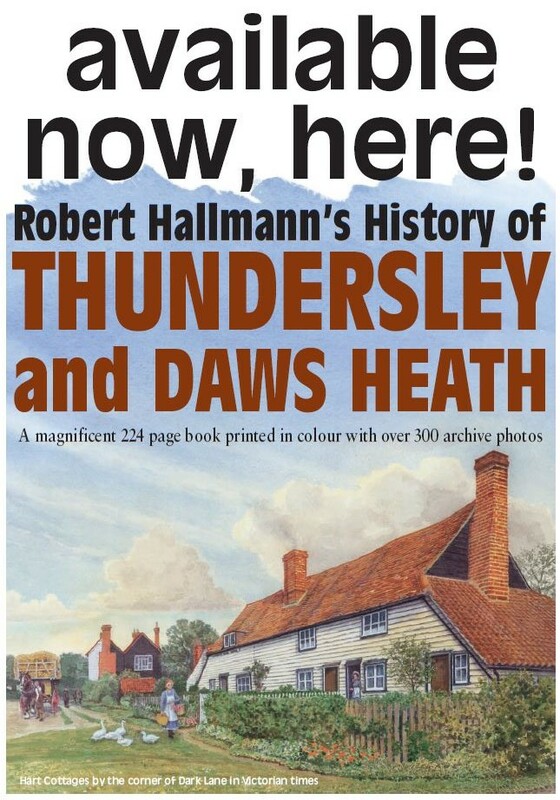 The hardback version is available for £20 at local history events. What an excellent publication, although haven’t yet had time to read it all as only received the book a few days ago. I was born in Park Road, Thundersley, and lived there for 31 years so know many of the people shown or mentioned. Have sent a copy to my brother in Australia – he is in one of the school photos. Congratulations to Robert Hallmann and everyone else concerned. Now shows where you can buy the book! 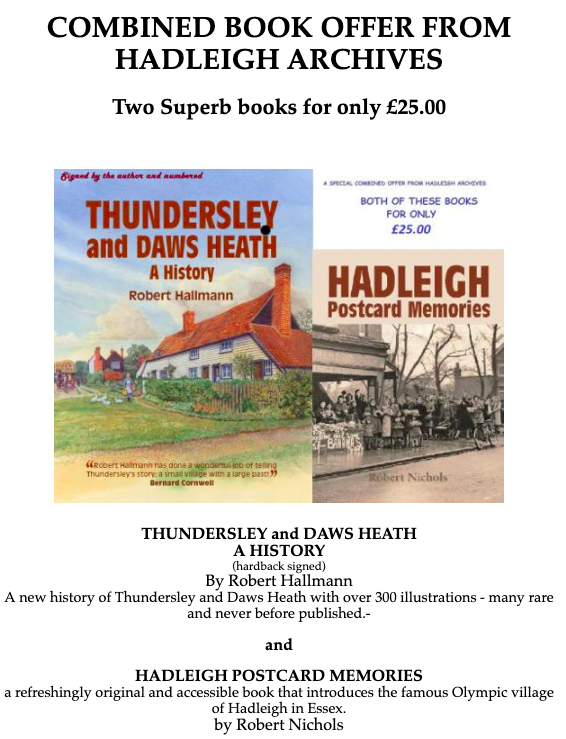 Spencer Welsh (of Rayleigh Through the Looking Glass) writes: Many thanks for alerting me to the new Thundersley & Daws Heath book. (I love the front cover!) It is an excellently detailed, documentary source written in an interesting and entertaining way. My appreciation and congratulations to all concerned for such an outstanding, masterful production. I was particularly interested in the Keys, Maley and Cook family histories. As a young boy I knew the Rayleigh branch of Eric Cook very well: he was a market gardener and pig breeder and had lots of children! In the early 1950s I would be recruited to hoe weed the lettuce plantation and pick gooseberries at Rayleigh, also at the ground behind Maley’s store in Rayleigh Road, earning fantastic pocket money of 7 shillings and sixpence a day during holidays. This was worth dodging sports day for and better than sharing in my brother’s Daws Heath paper round! Long gone happy days! For your interest, I have only studied random pages so far, but note pic 300, the AA man was Mr Godolphin who lived at 33 Castle Road Rayleigh (his son is our neighbour) and, on my way home to Eastwood Road from Love Lane School, I would admire his beautiful, immaculate, yellow and black liveried AA motorcycle combination parked in the orchard. Mr Godolphin who served in France during WW1 was captured and ill-treated in captivity. Pic 177 shows my uncle, Sergeant William George Francis Welsh (1900-1973) in the Hadleigh Home Guard, front row seated fourth from left. My father was meantime carrying out essential war work building aircraft hangers in the aerodromes around Liverpool, but living in Shropshire where I was born. Please keep me posted on H&TCA activities.